Men and women are different. A seemingly obvious statement, yet one that is up for debate nowadays. Our world is fighting to convince us that, besides their reproductive systems, there are no significant differences between a man and a woman. The logic goes like this: 1. Men and women should be equal. 2. Equality means the same. 3. Therefore, for men and women to be truly equal, they must be the same. But equality does not equal sameness. This concept is widely understood in many areas of life. Consider the cultures in the world. Asian, European and South American cultures are all very different. They connect differently, eat different foods, and celebrate differently. Is one culture greater than another? Should all the cultures of the world be exactly the same so they can be equal? Of course not. It is the differences within the world’s cultures that bring so much beauty and value to the human race. I plan to take a couple weeks to post a series of articles on this topic of Biblical womanhood. Why is this topic important to me? For several reasons. First, I am deeply loyal to the One who has spared my soul from its deserving end of eternal death, and therefore care deeply about what He has to say about my womanhood. Secondly, I believe that this same loving God was incredibly intentional about how and why He created man and woman and therefore what He has to say on the subject is my most trustworthy source. And lastly, I am a living example that "the truth will set you free." (John 8:32) My life is more full of joy, peace, purpose, and contentment as a result of the very truths I hope to share over these next weeks. So this topic is deeply personal to me as much as it is deeply theological. So, recognizing God as the Creator of male and female and recognizing the Bible as our only undisputed, authoritative Word of God, I will be discussing the beautiful design of our womanhood over the next several weeks. Another reason for writing about this is due to the great effort our culture is currently putting into minimizing the God-designed distinctions of the genders. Any movement toward a world where gender doesn’t matter is an assault on God’s design and on His purpose for humanity as His image bearers (Gen 1:27). While the principles of the world will always be contrary to Christ, the last 50 years have contained a concentrated effort to destroy gender distinctions by the feminist movement. Most of us grew up under the influence of this ideology and have never taken the time to acknowledge the potential impact it has had on our thinking. It’s worth asked the question, have you been discipled by the feminist movement? The heartbeat of feminism is women’s rights, primarily as it relates to men. Equality is sameness is an assumed truth. Namely, if women are truly equal with men, then they have the right to be exactly the same as a man in every way. While there are some steps toward equality that feminism has rightly secured (the right to vote, equal pay, etc), most of the movement falsely assumed that a woman only has value when she is just like a man, effectually stripping womanhood of all that made it beautiful, unique, and powerful. Thanks to feminism, the idea that women are distinctly different than men and called to different things seems old fashioned. Nowadays, all roles are interchangeable, and everyone has the right to determine his or her own definition of manhood or womanhood. Feminism took God out of the equation and spread the lie that we can determine what it means to be a woman, and no one has the right to tell us otherwise. What have been your thoughts on Biblical womanhood? Does it scare you when you think of what the Bible has to say about women? Or do you believe that the Bible is true and that is sets women free? 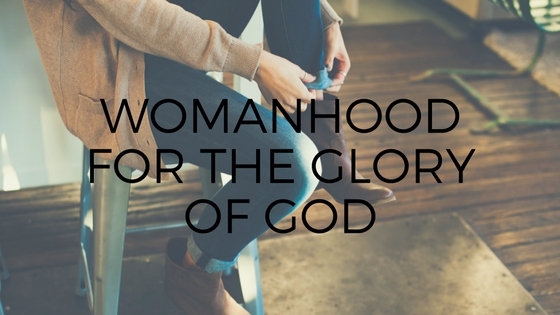 Have you ever considered that God might have something to say about our womanhood? What influence has the feminist movement had on you and how you view yourself and others? What to share or print this series or go through it with a group? Get PDFs of this whole series here.